Coming from a very traditional metal background, I am somewhat hesitant to check out anything that is too much on the extreme side of things. Don't get me wrong, I do like me some occasional black or death but there is a point where it all becomes so much noise and not so much music so if it is too far along I just can't really sink my teeth into it. A bit of blackened thrash here or melo-death there though is fine with me, so I jumped at the chance to check this out and broaden my horizons a bit. Loudblast are from France and have been around since the 80s with a couple of minor breaks in there. Honestly I am not real familiar with the band but when I saw they are veterans I knew it was time to check them out. I did a little digging and see that the vocalist is the only original member of the band. Not necessarily a bad thing and as far as deathy vocals go this is really quite good as he is imminently listenable. What bugs me the most about extreme music is usually the vocals as I am a bit of a linguist and find it very hard to get into the music if the vocalist is hard to understand (same is said for non-English language music, though as in all things there are exceptions!). Getting back to the matter at hand, this CD is actually a lot of fun to get into and I find myself wanting to check out their back catalog and find out what I have been missing out on. Tracks such as A Bloody Oath, Darkness Will Abide, The Path, I Reach The Sun and From Dried Bones are all crisp and really stick with you and reverb around in your brain a bit well after the dust is settled! 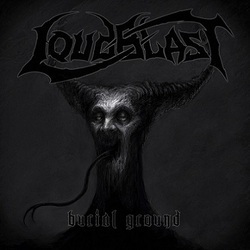 For me that is pretty rare with this style of metal, so Loudblast are definitely doing something right! Melodic deathrash done with a bit of beauty and grace, or something like that. Either way, good stuff to be found here!